Depths of My Mind brings to life the latest developments in neuroimaging connected to the teenage brain. Suspended above the audience on moving transparent platforms the performers take us to a world where nothing is solid, and explore how it feels to be growing up, changing and searching for somewhere to belong. Based on the finding of the U-Change Project led by scientists from the Neuroscience in Psychiatry Network (NSPN) at Cambridge University, Depths of My Mind is a mind-blowing immersive theatre show combining breathtaking aerial skills, a pulsating soundtrack and stunning projections. 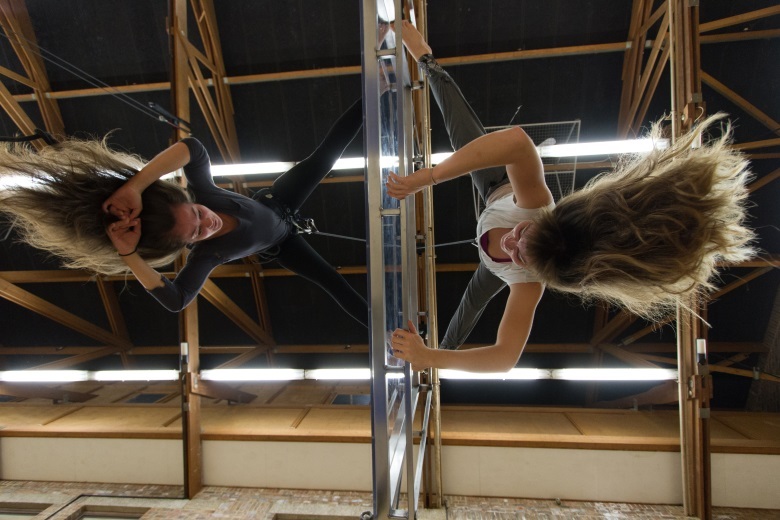 Performed by Scarabeus Aerial Theatre in association with Polka Theatre. ; supported by Wellcome Trust, Arts Council England, National Centre for Circus Arts and Caxton House. Rigging points required over most of the performance area - we can span between beams if needed. Anchor points in the floor required; we can install or create these with weights. The below required floor size is ideal, but we may be able to adapt to smaller venues. A site visit is paramount early in the process for all venues.